"Beautiful Resort and Beach...Excellent Service"
My husband and I just returned from Cancun. We stayed 6 nights at the Grand Fiesta Americana Coral Beach. We just loved this Resort. This was our first time in Cancun so I have nothing to compare it to but have stayed at several resorts in Hawaii as this was just as nice. We purchased our package through Costco Travel, it included the daily breakfast buffet and the Black passport coupon book. The breakfast buffet is fabulous, so many options. You can eat something different each day. I also loved that it was open 6:30-noon. Most day excursion leave around 7:30 so you can eat before or if you are like me and cannot eat a big meal first thing in the morning. You can get a cup of coffee from the gym and eat brunch later in the morning. BTW- fresh fruit, small pastries, coffee and tea available at the gym. We stayed in the “cheapest” room and it was really nice. All rooms have a view of the ocean. Certainly being on a higher floor will give you a better view but i was very happy with the room we had. Room was very clean, AC worked well. Nice shower. Housekeeping comes twice a day. Turndown service with little chocolates. We had all but one meal at the hotel. We enjoyed all our meals. If you have the coupon book, there are several coupons for the restaurants. We also had a romantic dinner in the spa that was included in the coupon book. Dinner in the spa was good, but I enjoyed the other restaurants more. We did do room service one night. Very nice. We also felt food and drink prices were reasonable. The grounds are well cared for. They have staff working all the time cleaning and taking care of the property. I don’t think i have stayed anywhere with so much staff available for any request or guest needs. There is someone available to wash your feet coming in from the beach. With the exception of one day, the beach was free of seaweed. The day we had seaweed it was after a storm and I believe it stirred up more seaweed. I am not sure why they did not get out right away to clean it, but they probably had a reason. I was really concerned about the rule of no outside food and drinks. Several reviews said they make you sign something and that you will be charged. This is not the case. They don’t want you cooking in your room and clearly state snacks and leftovers are not included. They have a NICE grocery store across the street. I bought some soda and a some snacks. I even took out the hotels drinks from the mini bar and added my soda. Nobody said anything and I was not charged. This place is so accommodating. I highly recommend and look forward to returning. We had a wonderful vacation over Spring Break. The service is wonderful and the pools are the best among the Cancun hotels. Across the street is a supermarket for snacks. Floaties were allowed in the pools. Meal pricing was pretty reasonable. We are a honeymoon couple currently staying at the hotel and everything is just perfect! The food the service and the location the best hotel I have ever been They sent us an e-mail at the time of the reservation, which kept us a suite on a high floor and from the moment we arrived we were just spoiled Must indicate that the service level is very very high! WOWWW!!! The best spa in Cancun and the Caribbean is waiting to take you on a journey where the luxury and elegance of the location combines with the enchantment of the treatments. The Spa's complete hydrotherapy program and gem therapy help you achieve balance of mind, body and soul. Coral Beach Gem Spa has 26 treatment rooms: 10 multi-function rooms, six massage and facial rooms, two Spa Master Suites with hydro-massage bathtubs with chromo-therapy, five couples treatment rooms, one VIP Spa Suite for couples with a double Jacuzzi and steam room, and two rooms for Shiatsu and Thai massage. The Spa offers separate areas for men and women, as well as mixed areas to enjoy with your partner or friends. It is a captivating setting that seduces the senses, achieving depth, elegance and luxury. The rich natural textures of wood, black granite, sand, marble, onyx and Venetian mosaic add a touch of great luxury to the spa experience, designed to reward you with magical moments of relaxation and beauty. 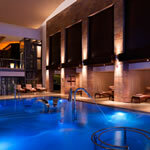 It is the only spa in Cancun and Latin America that provides a complete 10-step hydrotherapy program. The hydrotherapy has Aromatheraphy Steam room, invigoration shower, clay room, rain shower, sauna, ice room, jacuzzi, polar room, pebble creek walkway and the pool of sensations. The magical Spa is on the hotel's fourth floor. You will receive a consultation from the professional staff and be guided at all times by an assistant who will offer you exclusive attention. It also has a beauty salon with a fine selection of services for women, men and children, as well as a boutique where you can peruse the collection of gems and exclusive products—from Vagheggi, Natural Benefits and Germaine de Capuccini. Treat yourself, and take something home.